Are you ever in the mood for a yummy, crunchy, salty snack...but want to keep it healthy? Somersault Snacks are perfect to satisfy that craving. They provide impactful, nut-free nutrition, offering the same protein as almonds yet with half the fat and fewer calories! This goodness is powered by sunflower seeds. 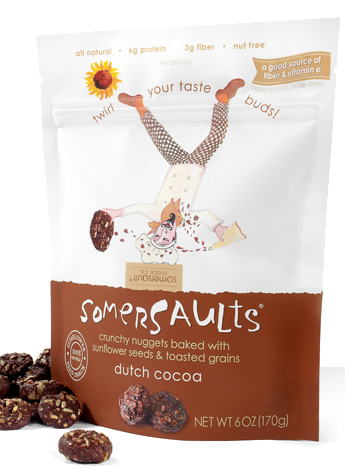 Every little nugget is packed with sunflower and sesame seeds, making them a good source of fiber and vitamin E.
Somersaults are available in four delicious flavors: Pacific Sea Salt, Dutch Cocoa, Salty Pepper and Santa Fe Salsa. I was lucky enough to be able to try all four flavors and I had a hard time picking a favorite. I normally don't even like salt & pepper flavored snacks, but I enjoyed the Salty Pepper Somersaults. The black pepper gives them a good flavor kick, but it's not overbearing. The Dutch Cocoa are perfect for when you can't decide whether you want a salty snack or a sweet snack because they satisfy both moods. The Santa Fe Salsa kicks it up a notch on the spicy side. But, I have to say that my overall favorite is the good old Pacific Sea Salt, which lets the nutty flavor of the sunflower and sesame seeds shine through. Reader Giveaway: One lucky Jinxy Knows Best reader will win a selection of Somersault Snacks. To enter, just "like" Somersault Snacks on Facebook and then come back and fill out the form below. To tweet about the giveaway, you can use: RT @ThriftyJinxy Enter the Jinxy Knows Best #giveaway to win @SomersaultSnack goodies! Enter at http://bit.ly/dIbKhG RT for an extra entry! Rate Jinxy Knows Best on Alexa. Rules: All entries must be received by 11:59 PM CST 5/12/11. One entry per person, except for extra entries (see above). Entrants must be at least 18 years old and reside within the United States. Winner must respond to the winning e-mail within 48 hours or a new winner will be selected. Disclosure: I received sample product for review. Any opinions expressed above are my own.